Some years ago, during my studies of beneficial insects in gardens, my graduate advisor returned from Germany with a well-chosen gift: Das Insektenhotel, a book about “insect hotels,” constructed habitats for insects. One look at the charming illustration on the book’s cover, and I knew I must have a hotel in my garden. I was familiar with bee blocks, designed to accommodate nesting orchard mason bees, but this book’s author suggested that hotel lodgers could include a wide variety of pollinators and other garden allies. Das Insektenhotel is packed with detailed plans for insect homes, charts of plants that provide pollen and nectar, and details of the natural history of beneficial insects that may use hotels (including many common insects found in Europe, North America, and elsewhere). Despite my rudimentary German language skills, Das Insektenhotel quickly earned a favored place on my bookshelf. With its most relevant passages translated, it is likely to remain my best reference on the subject. Insect hotels have long been popular in Germany, where forests are highly managed, leaving few suit- able nesting sites for wood-nesting bees and wasps. When declines in these insects became evident, instead of restoring habitat, forest stewards provided “hotels” of drilled wooden blocks and hollow twigs, designed to attract hymenopteran guests. Soon, hotels included accommodations for overwintering insects and became increasingly common in the Netherlands, the British Isles, and elsewhere in Europe. They have only fairly recently crossed the Atlantic, popping up occasionally in private and public garden settings. Insect hotels add a charming focal (and conversation) point to gardens and have the potential to become a common landscape feature, but do they attract lodgers? Part of the appeal in creating a hotel is in the artistic expression possible in assembling “rooms;” materials may include hollow stems, twigs, bark, leaves, lichen, and blocks of wood drilled with holes in a range of diameters and depths. The challenge is in knowing which garden allies will check in to a hotel, and what sort of accommodations they prefer; many insects are choosy about nesting and overwintering sites. Insect hotels may vary from a simple bundle of hollow stems, to a highly ornate edifice. Only certain species of insects will use artificial habitats. Over seventy percent of native bee species, for instance, are ground nesters; a “hotel” for them will be a sunny bank of earth. Bumble bee boxes (buried in the ground) are successful only ten to twenty percent of the time. In agricultural settings, insect hotels must be practical. They are designed to attract native bees, such as orchard mason and alfalfa bees, both known to use predrilled bee blocks. In gar- dens, however, there is license to be more creative. Insect hotels attract many species of bees and beneficial wasps; they may also include habitat for lacewings, beetles, butterflies, and assorted other arthropods. Each species may have different nesting requirements; for instance, different species of native bees use holes of specific diameters (much as birds do). Inevitably, spiders and other arthropods such as centipedes, millipedes, and isopods will move into a hotel. Some, such as spiders, are wonderful garden allies, but may also prey on beneficial insects (such is the way of the garden). There are regional considerations as well: many European designs, for instance, include earwig habitat; that surprised me, until I learned that the omnivorous European earwig is a beneficial insect in its natural habitat. Undesirable insects, such as Argentine or fire ants, may need to be controlled in some regions, and some birds may treat the hotel as a restaurant. Gardeners have long kept honey bees and planted flowers for butterflies; in recent years, they have broadened their horizons to include habitat gardens for a multitude of other garden allies. In addition to attracting pollinators such as native bees, habitat gardens are gaining acceptance as a means of reducing, or even eliminating, pesticide use. The contributions of beneficial natural enemies, such as lady bird beetles, hover flies, lacewings, predatory and parasitic wasps, are well-known. Planting beautiful flowering plants (pollen and nectar resources) is the best method for attracting natural enemies and pollinators; plan for the longest succession of bloom possible. Butterfly gardens should also include larval host plants for caterpillars. Some gardeners have learned how to sustain long-term populations of natural enemies by providing alternate prey during lean times. A source of water, over- wintering sites, and shelter from wind are other important habitat offerings. An abundance of native plants is appropriate; bunch grasses are an important source of early season pollen and provide overwintering habitat for many insects. “Layer” the garden with forbs, grasses, shrubs, vines, and, if there is room, trees. Keep a pile of leaves or brush in a corner. A certain amount of “messiness” in the garden, especially in winter, also encourages insects: maintain a natural leaf mulch under trees and shrubs, and wait to cut back perennial plants. Other than the well-documented effectiveness of artificial homes for several species of solitary pollinating bees, little is known about the hotel use by other insect groups. Even in the case of bees, the holes in many commonly sold bee blocks are not deep enough. For good reason, scientists discourage moving populations of native bees (and other insects) into new geographic regions; rather than order bees by mail, attract them with habitat gardens and bee blocks. Many insect hotel designs incorporate butterfly apartments, which are intended to replicate the gap between bark and tree trunk that some butterfly species favor as an overwintering site. While providing a butterfly home is appealing to gardeners, there is no solid evidence that such homes are appealing to butterflies. In general, the value of incorporating overwintering quarters in hotels, while popular and adding interesting design elements, is debatable in any but the most barren habitats. Even a relatively small garden space should be able to accommodate overwintering insects. The lack of available information presents an ideal opportunity for amateur garden entomologists (we are legion!) to make significant contributions. There are so many questions to explore: Which species of insects use hotels? What are the differences between insects in hotels in urban and suburban areas? In habitat-rich versus habitat-poor environments? Which insect populations grow over time? Is there competition for rooms? Do some insect species use the hotel as an overwintering refuge? What are the challenges? Perhaps the hotel’s greatest value may be as a conservation tool in areas of impoverished habitat, such as managed forests. Insect hotels are an engaging educational element in public and school gardens. 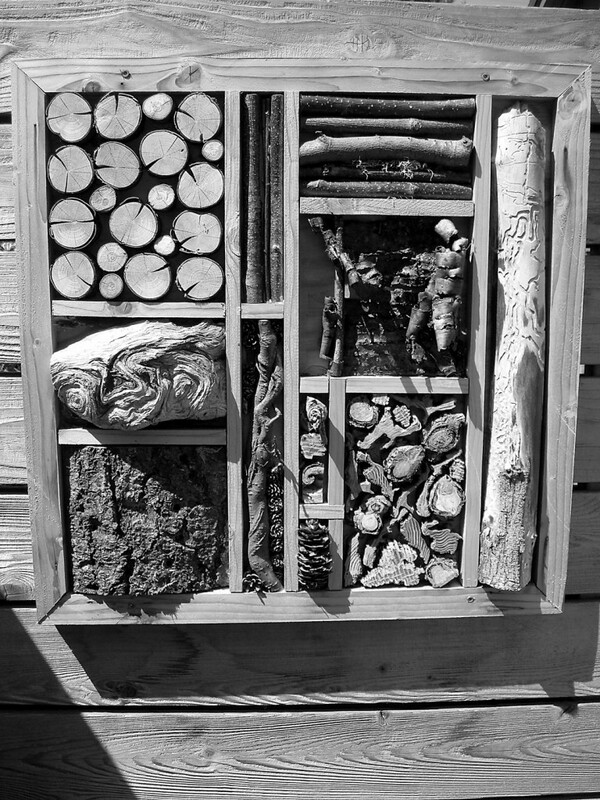 An insect hotel can only accommodate a fraction of the insect species present in a garden, but adds a unique decorative element, and instantly attracts attention. Perhaps the hotel’s greatest value may be as an educational element in public and school gardens. A strategically placed bench encourages close observation of the activities of hotel lodgers, and becomes a highly engaging way to explore the world of garden insects. Students of all ages can collect and assemble nesting materials, design and decorate insect homes, and plant surrounding habitat. Art, math, biology, and many more subjects come into play. Hotels in some public gardens include interpretive signs explaining the benefits of attracting beneficial insects to gardens. 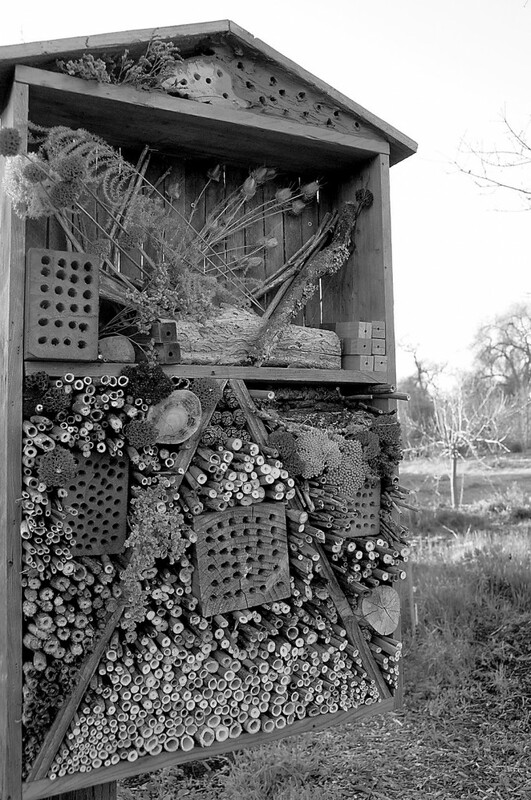 An insect hotel offers an opportunity to start a conversation, to discuss why insect conservation is important, and why enhancing and connecting habitat is critical—from urban to suburban, from agricultural to wilderness. In the Garden Classroom at Sonoma State University, our insect hotel is ready for occupancy. As the days lengthen, and lodgers arrive, perhaps we can begin to answer some of our questions. Few resources on insect hotels are available; much of the information in this article was gleaned from conversations with knowledgeable entomologists and other experts. Thanks are due to Dr Nathan Rank (SSU) for translation of relevant passages in Das Insektenhotel, and to him and Drs Scott Hoffman-Black (Xerces Society) and Gordon Frankie (UC Berkeley) for review and comments. Liam O’Brien, Scott Iverson and Lisa Lee Benjamin also contributed to this article. Any errors are the author’s.